Lateral Collateral is an interesting sport game. This game has unique graphics, suitable for all ages, especially children and families. You can experience this game on your browser because it is a flash game. 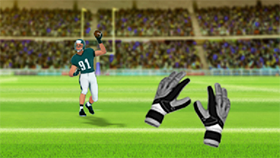 In this game, you control the football players. 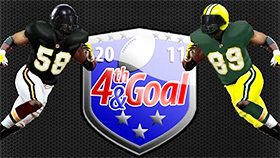 Your task is to grab the ball, get past all opponent defenders and run to the end zone safely. This game has many levels, each level is a challenge for you. In each level, you face many defenders. You can only pass them by passing the ball to your teammates (you will control a team with 5 players). Try to timing correctly to pass the ball to your teammates. If you miss the ball or you are stopped by a defender, you lose 1 chance. You have 5 chances in this game. When you lose all your chances, you lose and the game ends. Each time you complete a level, you will gain points. Try to get as many points as you can. Good luck!